Small fiber neuropathy (SFN) results from impairment of small-diameter myelinated Aδ- and unmyelinated C-fibers. This debilitating condition usually leads to alterations in nociceptive processing, thermal sensations, and autonomic functions. 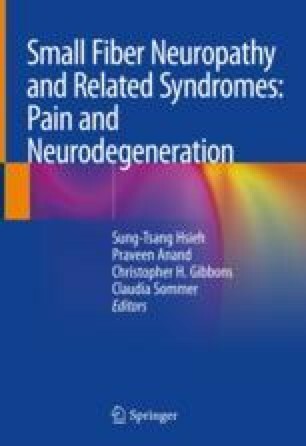 The most common clinical feature of SFN is neuropathic pain, which is often described as burning, shooting, tingling, and even pruritic. Usually, symptoms have a length-dependent distribution, but they may also present in a non-length-dependent manner. The natural course of SFN is highly variable, and, in some cases, large fiber neuropathy may develop. Despite being regarded as a distinct nosologic entity, SFN is either idiopathic or associated with a heterogeneous group of diseases. The pathogenesis of the development and maintenance of SFN is not completely understood. Recently, gain-of-function mutations of the sodium channels have been found to enhance the excitability of dorsal root ganglion neurons, which may explain the presence of neuropathic pain symptoms in patients with SFN. However, the underlying mechanisms leading to the axonal degeneration of small-diameter sensory nerves remain unclear. On neurological examination, impaired small fiber sensations can be detected, including thermal or pinprick hypoesthesia or hyperalgesia, and allodynia to mechanical stimulations. At present, the diagnosis of SFN relies upon clinical signs of small fiber damage, abnormality in small fiber neurophysiological testing, and reduced intraepidermal nerve fiber density. Non-length-dependent SFN is underdiagnosed due to the absence of a typical topographic pattern. In conclusion, patients having chronic pain and autonomic dysfunctions with unclear causes warrant a diagnostic consideration of SFN. After the diagnosis is confirmed, underlying etiologies that are potentially treatable should be investigated.